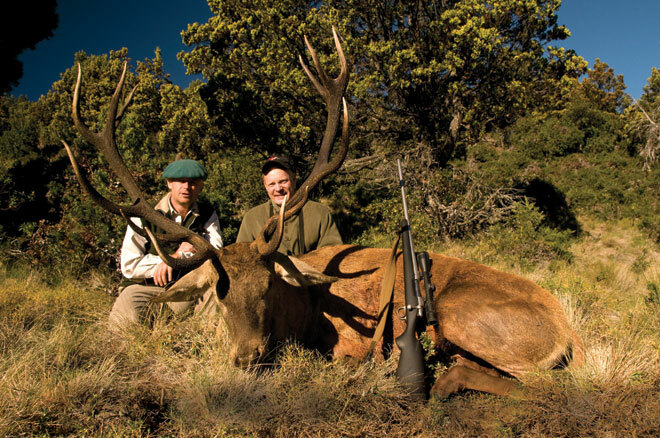 Craig Boddington, and his guide, Cano St. Antonin, with a fine red stag taken on the Huemul Peninsula. Argentina conjures a variety of images for those who’ve never been there. There’re the gauchos, the Pampas, and tango. For the angler there are the monster-sized trout and salmon in rivers that seem untouched because of the stretch of land that fills the borders of the country as well as its meager population that centers around Buenos Aires. For the hunter, there are the photos and images of ducks and big-game that have graced magazines, and as of late, those through the onslaught of 24-hour outdoors satellite programming. It wasn’t always like this. Yes, there were the trout, back in the 1970s when South American was truly only a blip on the salmonid fanatic’s radar; but when I first saw the images of red deer antlers grace the pages of hunting magazines in the late 70s and early 80s, they were nowhere near the size and impressiveness they are now. Much of this has to do with how well they’ve managed the herds that were previously left to roam without any real predation-like bluegills in a pond, they quickly overpopulated and their rack size dwindled in response to the lack of food and nutrients. Because of the new land and wildlife management practices implemented in Argentina during the last 20 years, Argentina is really giving New Zealand’s Utopian red stag hunting a run for the money. Culling the scrawny genetics, and managing for quality instead of quantity, has created a balance between feed and minerals: showing how good management practices benefit not just game animals but non-game peripherals, adding to the grand beauty of the land and hospitality for which Argentina has always been known. What better way to cook meat than in a traditional parrillada? 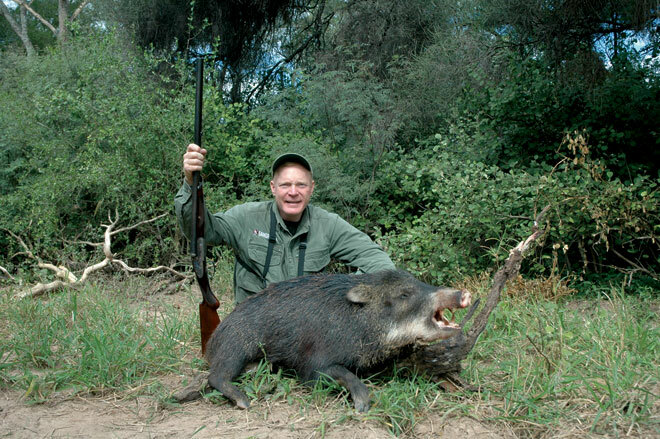 Big Game Argentina records the results of this improved bounty for the outdoors enthusiast wanting to travel Argentina and is the latest offering from Gen. Craig Boddington USMC (ret.). An outdoor writer, book author, show host I’ve admired and respected for years, a man who offered me words to live by back in 1994 as an newbie outdoor writer for The Times of San Mateo County, Boddington’s credentials speak for themselves with over 30 years in what is one of the harder and becoming more and more the hardest writing profession to create longevity. In his book and DVD collection about hunting in Argentina, Big Game Argentina, Boddington and the photographer, Guillermo Zorraquin, deliver a plethora of what’s available in striking detail (what we in the business call “NGC”, National Geographic Color). From the province of Patagonia, north to Chaco and Santiago Del Estero, west to La Pampa and finally east to the province of Buenos Aires, Boddington and the publishers John John Reynal and Juan Pablo Reynal took on an enviable, yet sobering project that took two years to complete. In the offering, they delivered what I consider the most informative and beautifully illustrated book in years on Argentina and hunting red stag, white-lipped javelina (peccary), ducks, doves, water buffalo, puma, blackbuck, capybara, brocket deer, and feral sheep, goats and hogs. In a world in which text is not enough, and as a result traditional printed magazines are going the way of the dinosaurs, and multimedia is king (explaining why Cork’s Outdoors gets 11,000 hits a day) Big Game Argentina is nicely matched with a DVD that fills in the dialogue and action that can’t really be captured in text, and yet video doesn’t try to replace the informative quality of text delivered by Boddington’s honed skills as a writer. A quick mention of the charcoal artwork by Esteban Diaz Mathé must be made: the work is superb and really adds to the quality of those images not captured in photographs, making the book anyone would be proud to have sitting on their coffee table for friends to enjoy. 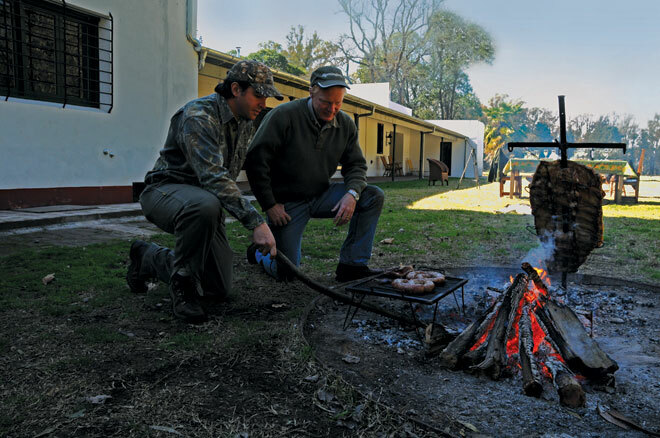 Often, many of those traveling think that hunting Argentina only involves staying at estancias and hunting open Pampas. 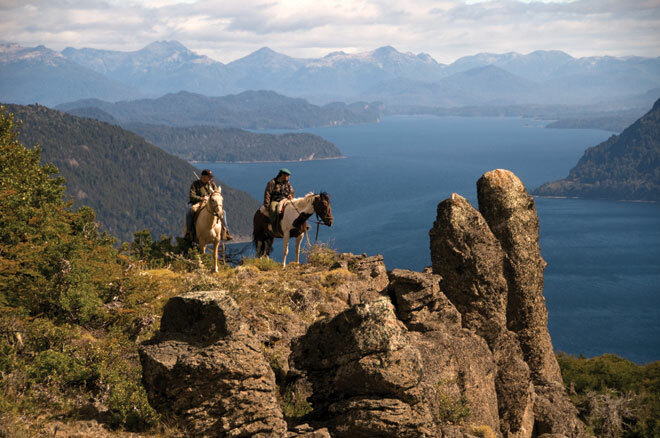 Big Game Argentina lays that stereotype to rest with text and photos covering with dramatic flare the many options of hunting Argentina: like French Alps-like mountains and New Zealand’s Fjordland-like lake and sea area to the south on horseback, or the low brush options further north, reminiscent of eastern Colorado, and the flat brush of Texas, to name a few. As for capturing the adventure and drama a place like Argentina on the DVD, one of the most striking scenes is one in which Boddington, while on stand, waiting for dogs to drive out a collared peccary, sees a brocket deer break from the brushline. Swinging on the brocket with a shotgun, he dramatically takes a nice deer that reminds me of the dik-dik of Africa. In another scene he makes an amazing shot on a capybara, also on a full run. Kudos to the videographer for his skill catching all the action over Boddington’s shoulder. In contrast to the native species, and aside from the more famous red deer, there are the fallow deer, feral hogs and water buffalo. Raised in Southeast Asia, I was always amazed that the animal I always saw as a child pulling a plow across a rice field had become such a prized game animal in places such as a Australia and Argentina. While the ones from Australia have a much larger sweep and are originally from the wild strain. The ones in South America descend from the farmed water buffalo that were originally brought to what would become Italy by the Ancient Romans, for their milk and the best mozzarella resulting from that water buffalo milk. Through centuries of genetic selection, much in the same way Herefords are these days chosen over the original Spanish Texas Longhorn as cattle type, the farmed water buffalo has a much smaller horn, with a much less ominous wide curve of its originally wild cousin in Southeast Asia and Australia, which ironically makes it look more African cape buffalo and trophy in its own right in the feral and very wild form covered in Big Game Argentina. If you’re planning on hunting or even just traveling or Argentina, or prefer the armchair traveler’s voyage to South America, I’d highly recommend adding the book and DVD pairing of Big Game Argentina by Craig Boddington to your collection. Topics: Hunting Argentina, helpful advice for neophyte outdoor writers, hunting Africa and Boddington’s two shows broadcast on The Sportman’s Channel and Outdoor Channel, and finally what’s new with Boddington’s writing and adventures in the coming weeks and months. Holly Heyser over at her blog NorCal Cazadora has come up with an idea that has been pushed many times in the past, but perhaps this time it might just get enough momentum going: Let all those who serve on active duty in the military be charged the same hunting or fishing fees as residents, no matter that they might not be presently residing within that state. As an example, if you’re serving in the US military in Iraq and you want to hunt Alaska, you should be permitted to fly to Alaska on your R&R and walk into a sporting goods store, show your active duty card and pay the same fees to hunt as a resident Alaskan, even if your driver’s license says you reside in California or Texas, or wherever. If you’re prepared to spill your blood in defense of our homeland, it should be remembered that you’re spilling it for your country, not your state. The least each state can do is permit a woman or man in the service of their country pay a resident’s fees wherever they desire to participate in hunting or fishing. Some states permit this: all states should allow this! Go over to her site and comment, and here, too: we might just get a real wave of support going in a manner it hasn’t succeeded in the past…I think it’s time, don’t you? In an economy where many are actually wondering where they’re going to get their paycheck, getting the most out of what you buy is an utmost priority. 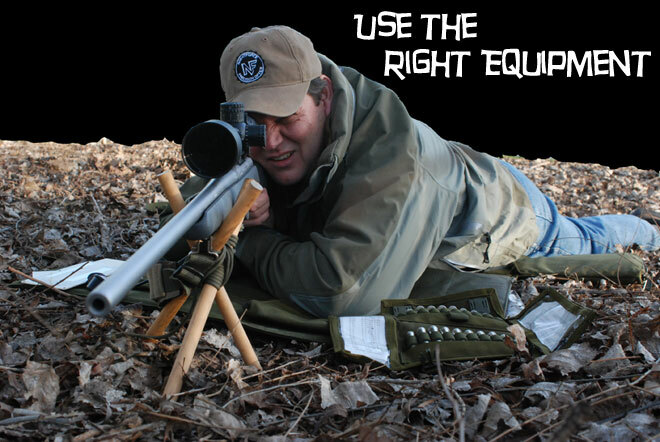 When I received a review sample of the Blackhawk!®, as I do with any new set of equipment or clothing, I immediately went into that mode of how to get that best bang for the buck. At first, it was hard as Blackhawk!® does a lot in making sure that a product delivers a variety of capabilities above the apparent. For example, instead of just offering a rifle case or a shooting mat, they delivered both. Actually, in the Blackhawk!®’s Long Gun Pack Mat with HawkTex™ they offered two capabilities, but delivered three: it also has a drag bag loop for it to be used as not only the advertised shooting mat and gun case, but also a sniper’s drag bag. Remember what I said in a previous column about how Blackhawk!® answers questions before they’re asked? 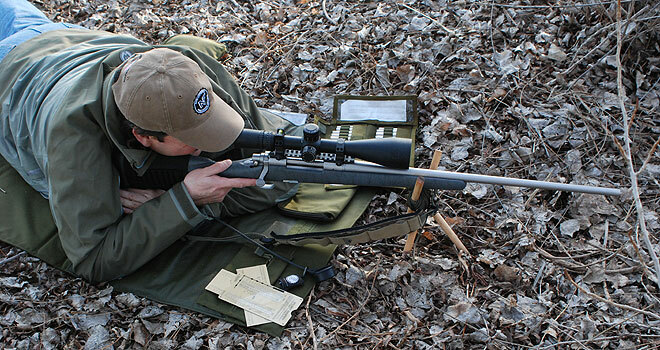 Well, they made it in spades with the Long Gun Pack Mat with HawkTex™. Constructed from 1000 denier nylon, and well-insulated by closed cell foam, it has a large compartment sealed by #9 YKK® zipper and sliders with silent zipper pulls. Easily able to fit a 50-inch rifle, it’s also adjustable by the appropriately placed straps and ties to snug up a normal sized scoped rifle. I really enjoyed the strap system that makes it a great pack scabbard. As for the drag bag capability, I would recommend adding tie-down spaghetti straps, all along the length, to be able to attach a Ghillie half-jacket as camo, or even local foliage directly. An extra compartment on the outside of the case can carry a number of items (I carried my extra ammo and trajectory tables in the Blackhawk!® Pro Marksman Folding Ammo Pouch inside), and easily fit the variety of hydration system options. There’s enough room for food, a space blanket, and water, along with 8 to 10-power optics and even a spotting scope in the pouch. What really surprised me was how comfortable the Long Gun Pack Mat was when deployed as a shooting mat. The HawkTex™ really helps keep you from fighting to keep your elbows propped up and not sliding around, depending on the type of coat you’re wearing. 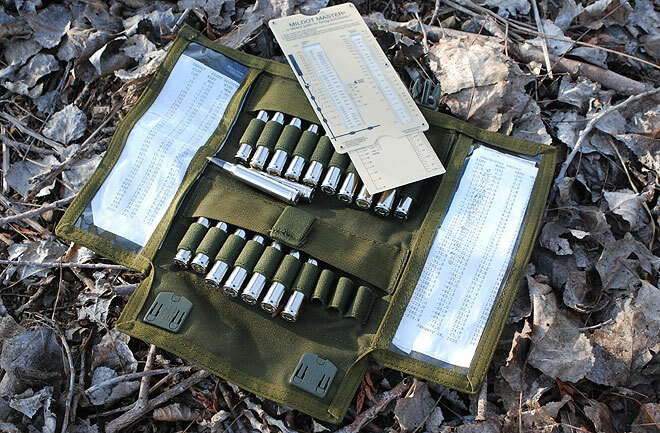 When the gun case is unfolded and deployed as a shooting mat, you not only have a pouch for accessories or a box of ammo sewn into the mat, but also another pouch that fits a shooter’s logbook for recording your rifle’s dope. 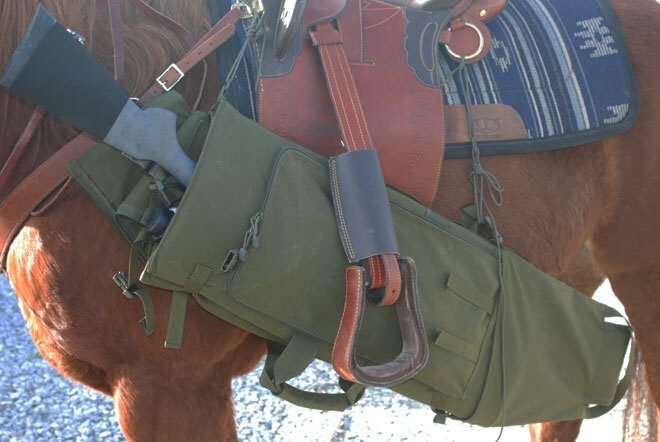 On the initial introductory ride with Michael Riddle at his Native Hunt Ranch, it worked perfectly as a vehicle scabbard, protecting my large objective Nightforce 3.5-15×56 NXS, keeping the dirt and drizzle out with no problem. It was during this same trip that I thought this would also make a great system to mount on a horse for my elk hunt planned for this fall. There are two D-rings on the case that enable an easy mounting to a saddle. During the jerry-rigging, I noticed that another D-ring about five inches above the edge might help raise the makeshift scabbard a little higher, permitting the rider to have a more proper stirrup handling. That the open edge faces down (when the mat if folded into the form of a gun case) is perfect for protecting the firearm from any water or snow. To utilize the product as a gun case or drag, there are three quick-release straps that retain the rifle in a centered position. For deploying the Long Gun Pack Mat with HawkTex™ as a rifle scabbard, I suggest either only using the two straps that hold the forestock and barrel, or don’t utilize at all them as I did: the sides do well in keeping the rifle inside with the barrel pointed down, as in the following photo. It makes it much easier to just slip the rifle in, barrel foreword, like a regular rifle scabbard, instead of restrapping every time you reinsert the rifle. I’d also recommend using actual webbing, say 3/4 or one inch, instead of jerry-rigging paracord as we did in the photo. Those special forces operators who have to fight in mountainous terrain on indigenous horses, such as has been in Afghanistan, should find merit in the added rifle scabbard modification. …BLACKHAWK!®’s Long Gun Pack Mat with HawkTex™, it’s a rifle scabbard! So, the next time you purchase worthwhile equipment or clothing, be sure to think out of the box and get your money’s worth! BLACKHAWK!®’s Pro Marksman Folding Ammo Pouch with two windows for checking your dope before your shot, along with the sliderule style Mildot Master. It never ceases to amaze me how often I meet hunters in the field who don’t know exactly what they’re rifle does, or think that 300 yards is a long shot for the average modern rounds: .270 Winchester, .30/06, .243 Winchester, .300 Winchester Magnum, .280 Remington, 7mm Remington Magnum, not to mention all the new rounds that have come out in the last decade. All of them, zeroed at 200 yards can permit you to shoot without any adjustment out to 275 to 325yards, depending on the round. Adjusting for bullet drop comes in from 315 on up. That’s when knowing your ballistic tables becomes mandatory. Just being able to have a set of trajectory values at your beck and call really helps when you want to really start shooting long ranges effectively. Knowing what your rifle and the bullets it sends down range is what those in the shooting community call, knowing your dope. Blackhawk!®’s Pro Marksman Folding Ammo Pouch is just what the shooter ordered. Manufactured from 1000 denier nylon (in digital camo, coyote brown, and olive drab), and closed with two velcroed and easily adjusted quick release buckles, it holds 20 rounds. Described as holding 20 rounds of .308 Winchester (7.62 NATO) in the marketing material, it easily fits 20 .300 Winchester Magnum cartridges, and creates a perfectly angled box, enclosing not only my preferred long-range ammunition, but my Mildot Master, designed by the late Bruce Robinson. Bruce Robinson cut his teeth on woodchucks at impressive ranges. 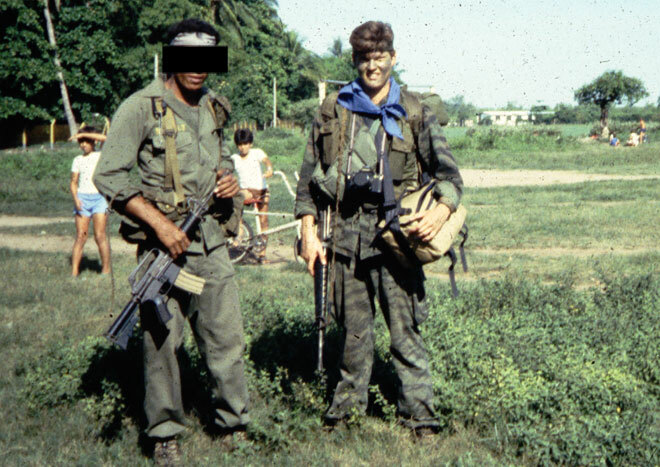 An engineer by trade, and shooter and a tinkerer by aspiration, Robinson took his knowledge of what every engineer, mathematician, and scientist never left home without (before the advent of the modern electronic calculator) the slide rule, and used it to create what is now issued to every Marine at the graduation from sniper school. Along with a repeat business to member of the military and law enforcement, Robinson’s widow does well selling the Mildot Master to hunters and especially those who enjoy shooting ground squirrels, prairie dogs and other varmints at long range. Not only was I able to easily keep the .300 WM rounds secure and silent, but the ammo pouch made a great two sided retainer to hold that Mildot Master. As an added bonus in the Blackhawk!® Pro Marksman Folding Ammo Pouch, there’s a loop for you to keep a pencil or pen to record your dope, but also two plastic windows on the inside of the loop. Using the Nightforce® BALLISTIC PROGRAM (I will be reviewing this well-designed product in detail soon) I was able to calculate my MOA and Milli-radian sheets for adjusting for wind and elevation. I placed those documents for easy reading in the clear plastic window pouches of the Pro Marksman Folding Ammo Pouch, truly a great addition to any shooter or hunter’s go-bag.